Who can resist this dark, rich brownie with a hint of a classic cocktail: The Old Fashioned. Really? Just in time for Valentine’s Day is one of my favorite chocolate recipes to share with your Valentine; they will appreciate the homemade decadence much more than a box of chocolate covered cherries, believe me! Whiskey-accented cherry preserves swirl throughout an almost flourless brownie that more resembles a truffle than its distant Betty Crocker cousin. The base for this brownie, which I’ve adapted over the years from its origins in Julee Rosso and Sheila Lukins’ The Silver Palate Cookbook, has been one of my signature desserts for over a decade. While it doesn’t yield the most attractive brownies – they are so rich that they rarely cut cleanly into perfect squares, I guarantee that you will be hard-pressed to recall a homemade brownie that was as delicious and decadent. I suggest you cut them into small squares, so you can savor each indulgent bite. Don’t be intimidated by the whiskey cherry preserves; simply heat, add liquor (whiskey or bourbon), and reduce down to its original consistency. Despite that the mixture will be more dense than the brownie batter, it works surprisingly well when swirled together with a toothpick. Maker’s Mark cherry preserves with a touch of added liquor. Whether you make the brownie alone or try it with the cherry preserves, I think you’ll agree that this recipe is a winner – sure to woo the heart and stomach of your Valentine this season! 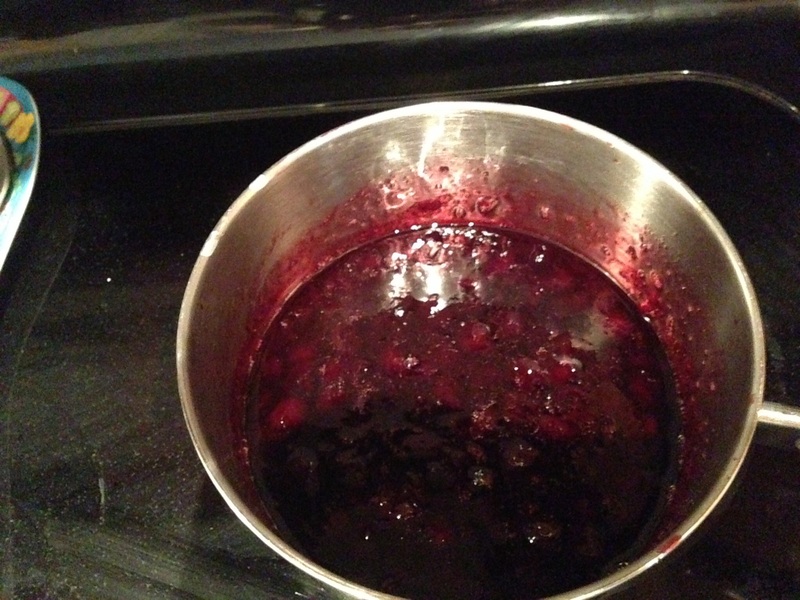 Cherry preserves: Heat the cherry preserves over MEDIUM-LOW heat until it begins to thin Stir occasionally. Add the whiskey or bourbon and whisk to incorporate. Mix in the orange zest. Allow the mixture to simmer until the liquid reduces nearly to its original consistency (added whiskey evaporates and the mixture thickens). Remove from heat and set aside. Preheat oven to 350 degrees Fahrenheit. Grease the metal baking pans with butter or line with parchment paper for easy removal. Cut butter into large chunks. Place about 1/4 of the butter in a large, microwave safe bowl or liquid measuring cup. Chop the unsweetened baking chocolate as finely as possible; add about half of the chocolate to the butter. Microwave on a LOW heat setting for 30 seconds. Stir to melt the chocolate and butter; add another 1/4 of the butter and stir until melted. Add the remainder of the chocolate and another 1/4 butter. Microwave again for 30 seconds on LOW; remove and stir until melted. Add the remaining butter and stir until melted. Set aside and cool to room temperature. Alternative method: If you prefer not to use the microwave, set up a double boiler and melt the chocolate with 1/2 of the butter; remove from heat and add the remaining butter. Stir until melted; set aside and cool to room temperature. Using an electric mixer, beat the eggs in the large mixing bowl on HIGH speed for about a minute. Gradually add the sugar while continuing to beat for another 1-2 minutes, or until the mixture is frothy and takes on a pale lemon color. Reduce the mixing speed to low and gradually pour the melted chocolate/butter mixture into the egg and sugar mixture. Mix with the electric mixer until uniform. Add the salt and vanilla and mix. Using a wooden spoon or spatula, fold in the flour until barely incorporated; next, fold in the chocolate chunks. Pour the batter into the greased baking pans. If adding the cherries, spoon the preserves (still slightly warm) in evenly spaced lines across the pan; swirl the preserves into the batter using a toothpick. Bake for 25-30 minutes, or until a toothpick inserted into the center of each pan comes out cleanly upon removal. If baking without the cherries, bake for about 25 minutes. A slight crust may have formed but will not buckle as in a traditional recipe with more flour. Cool for at least two hours before cutting into squares. I prefer to eat them chilled in the refrigerator, but I advise against chilling them before cutting them, as the chocolate chunks will be difficult to cut. Previous Post Healthy Diplomat: Vegan, no sugar added hot cocoa that actually tastes good!